One of our most important documents recently received a makeover – it’s now more to the point, reader friendly and visually stimulating. 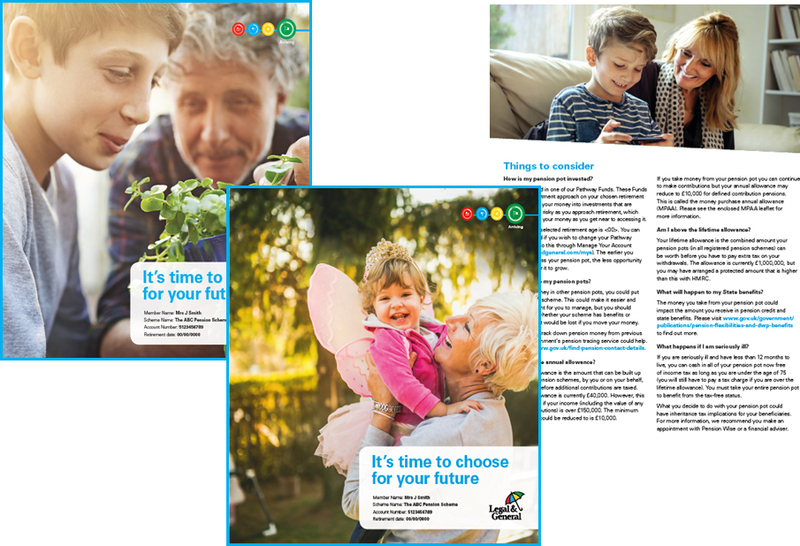 We use this pack to write to all members with detailed information about their options in the months leading up to their selected retirement date. The pack launched in January 2018. Helping members understand what their pension pot could be worth? We’ve produced a short, personalised video to show members what their pension pot could be worth. The video brings to life the current value of their pension pot, using pension benefit statement values and uses each member’s pension savings to project the potential future value of their pot. The animations are warm, to the point and easy to understand. The video can be emailed to members who aren’t currently maximising their pension contributions. To find out more please speak to your normal Legal & General representative.